CONCLUSIVE evidence that the British DID NOT cut off any Indian weaver’s thumbs. Myth busted. 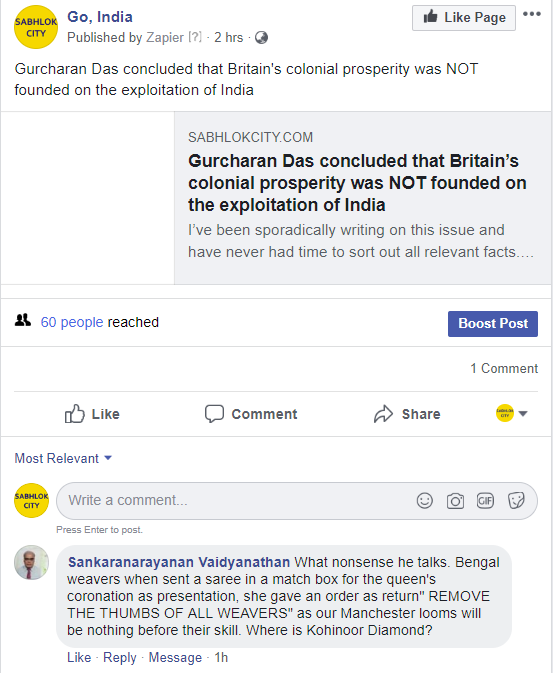 I decided to conduct original research on this topic given the following FB comment in response to my blog post on Gurcharan Das’s views (see this) – screenshot below. This particular view, below, is quite a radical new invention (that the Queen was involved – which one?!! ), but the more common one is that Dhaka weavers had their thumbs cut off. But McKenzie’s rebuttal is simply not good enough. When this professor has not even heard of it, how can he rebut the allegation? However, it cites no original sources that date back to the period referred to. This is quite a problem. If HUNDREDS of weavers had been so affected, surely there would have been some documentary evidence somewhere. However, I don’t have access to this particular book. This note suggests that issue arose during the impeachment of Hastings but doesn’t quite point to any original source on this issue. On the other hand, this particular 2013 discussion was very helpful in pointing me to the right direction. I look to the ORIGINAL SOURCES if possible, given such sources are now readily available. And the original source is WILLIAM BOLTS (see this blog post for the full quote – including from Romesh Dutta’s 1902 economic history.). The Bolts 1772 text shows clearly that the British were not trying to end weaving. They were trying to mopolise it and force the weavers to work for them. In doing this they did oppress weavers. BUT THEY DID NOT CUT OFF THEIR THUMBS. I also note that Dadabhai Naoroji’s 617 page book, Poverty and Unbritish Rule in India does NOT ever mention ANY weaver cutting off their hand. How is it possible that the ultra-diligent Naoroji would have missed this if it was anywhere documented? NO INDIAN SCHOLAR TILL 1900 HAD EVER IDENTIFIED THIS ISSUE. IT WAS INVENTED AFTER 1900. THERE IS NO EVIDENCE OF ANY BRITISH OFFICER CUTTING OFF ANY WEAVER’S THUMB AT ANY POINT IN INDIA’S HISTORY.